National Theatre and Bristol Old Vic’s co-production of Jane Eyre arrives at Theatre Royal, Glasgow on Monday 5th June until Saturday 10th June. The highly acclaimed co-creation between the National Theatre and Bristol Old Vic stars Nadia Clifford in the iconic role of Jane Eyre with Tim Delap as Rochester. Manchester born and bred Nadia previously appeared at the National Theatre in Alistair McDowell’s sell-out production of Pomona and Tim Delap will make his NT debut as Rochester. They are joined by Hannah Bristow (Helen Burns/Adele/St John/Grace Poole/Abbot), Matthew Churcher (Musician), Alex Heane (Musician), Melanie Marshall (Bertha Mason), Belfast born and bred Paul Mundell (Mr Brocklehurst/Pilot/Mason), Cardiff born David Ridley (musician), Evelyn Miller (Bessie/Blanche Ingram/Diana) and Lynda Rook (Mrs Reed/Mrs Fairfax). The cast is completed by Ben Cutler, Jenny Johns, Dami Olukoya, Francesca Tomlinson and Phoebe Vigor. 2017 marks the 170th anniversary of the first publication of Jane Eyre – a significant time to be touring Charlotte Brontë’s classic and much loved story. 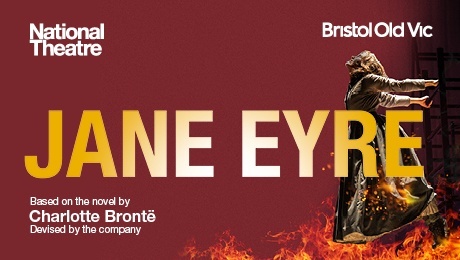 This exciting new stage version of Jane Eyre was originally presented in two parts at Bristol Old Vic, and then transferred to the National Theatre, re-imagined as a single performance, playing to sold out houses at the NT’s Lyttelton Theatre. The production was devised by the original company, with set designs by Michael Vale, costumes by Katie Sykes, lighting by Aideen Malone, music by Benji Bower, sound by Dominic Bilkey, movement by Dan Canham and dramaturgy by Mike Akers. Director Sally Cookson, said about her production of Jane Eyre: “Adapting a novel for the stage is a challenging prospect – especially when that novel is cited as many people’s favourite of all time. It is always daunting when you’re working on a story which everyone knows so well, because you want to surprise and maybe challenge people’s expectations, without losing any of the things which make them like the story in the first place. “I chose this particular title because it’s a story that I love and have enjoyed a close relationship with ever since I was intrigued, as a child, by Orson Welles’ black and white melodrama with fabulous music by Bernard Herrmann.